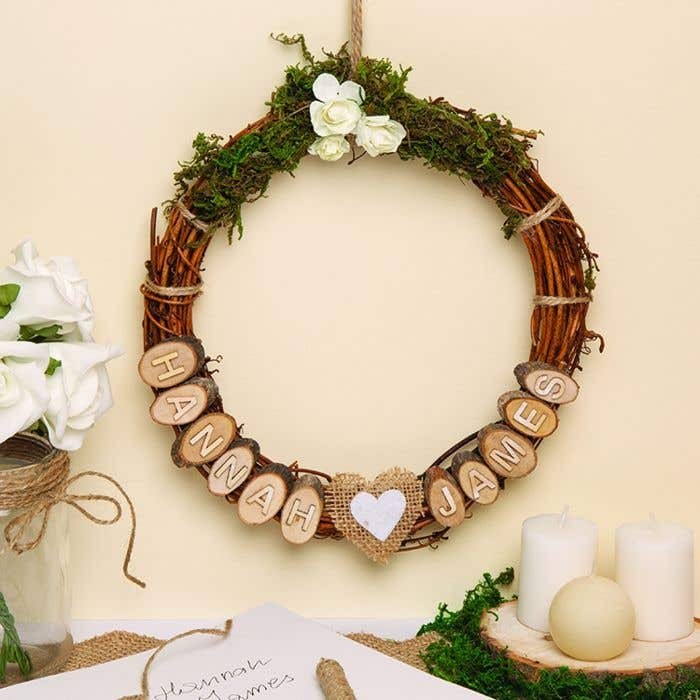 Use a combination of wooden lettering and natural materials to decorate a wreath for a personalised wedding decoration. Select some wooden letters for spelling out the names. Use PVA glue to stick individual letters onto branch chips, or for shorter names (3-4 letters) glue all the letters onto a larger-sized branch offcut. Leave to dry. 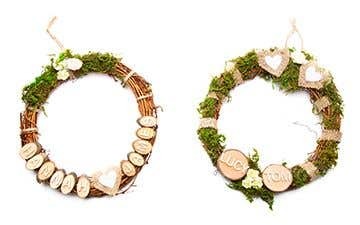 Glue the letters onto the wreath with a glue gun. Leave some space between the names if you are planning to add a heart or flower decorations. Tie some twine around the top of the wreath using a double thickness, then tie the end into a loop. Check the position of the letters; if they need adjusting, slide the twine around the wreath so the names hang evenly around the bottom of the wreath, or position them asymmetrically if you prefer. To make the heart decorations, fold piece of hessian 8cm x 8cm in half then cut out a 5cm long half heart shape. Open it out, then glue a small felt heart in the middle. 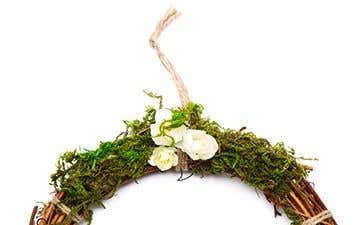 Squeeze some glue around the wreath using a glue gun, then press some dried moss over the top, working on one section at a time. Tie twine or glue hessian strips around the wreath. Glue paper flowers and hessian hearts to decorate around the names and over the moss. Short names with 3-4 letters will fit onto a single Circular Branch Offcut. 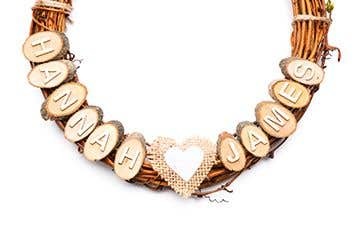 For longer names, glue letters individually onto the smaller-sized Natural Brach Chips. Lightly brush letters with white paint for a bleached effect.